From mustard to forest green to hot pink my nail varnish section is not only overflowing but looks like a rainbow ready to swamp the room. Doing my nails is something that I find the time and focus to do more than almost any other part of the beauty world. That certainly does not mean that I have my nails done constantly but compared to the amount of times I reach towards my makeup or my face masks it is certainly a regular event. Whenever a product does go on my nail I do my best to ensure that they get enough time to recover afterwards. Whilst it is generally a myth that nail varnish results in weakened nails there are certain chemicals or removal methods that seem to leave my nails breaking, looking a little flaky and that seem to lack the usual shine. It does not matter whether it is a cheap or higher end product or if it is supposed to have vitamins infused my nails simply perform best with a varnish on for a few days and then having a break before the next application. 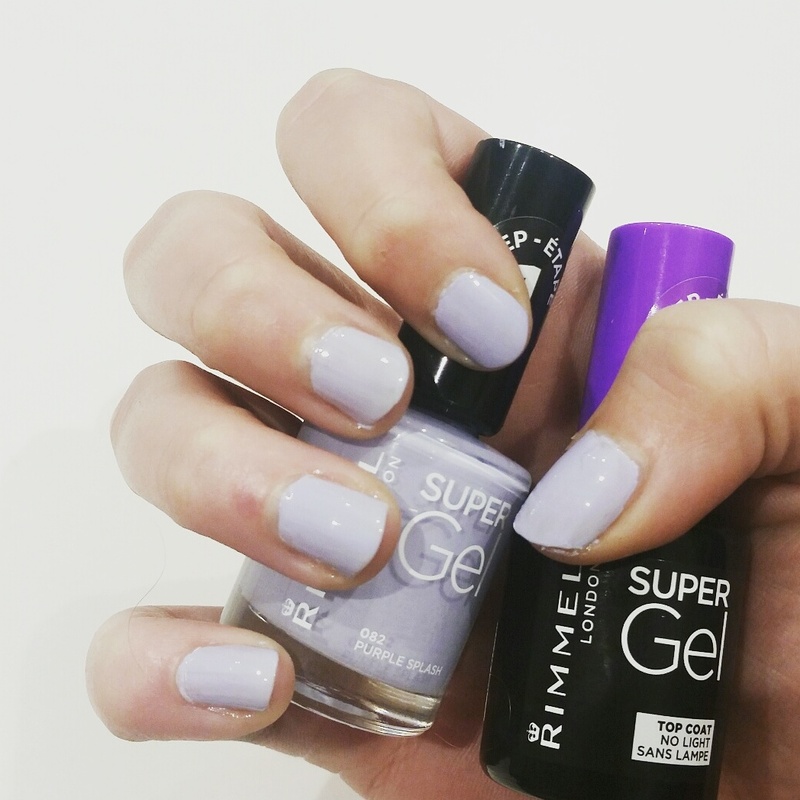 But when I recwived the Rimmel London Super Gel beach ready collection (through the post as PR/influencer purposes) in five bright shades that will add a pop of colour to any of my plain, simple and almost drab outfits I was excited to give them a try. With the simple application method of the colour followed by a special setting topcoat they do not require UV lights or a lot of time sitting around nervously trying to avoid touching anything. The more pastel purple, officially named Purple Splash, was the colour that I opted for as my first impressions shade as it struck me as the perfect Spring to Summer transition shade. Comparing it to a few other products I have this is clearly just a common shade and one that I tend to be attracted to when browsing the shelves in stores. After two coats of application the colour was fairly opaque and generally streak free although there were some sections that I did seem to struggle to get an even application (something I have not really experienced before) and after it dried I went about putting the top coat on to give it a lovely shiny finish. Each layer did take quite a while to dry though and compared to using a UV lamp I felt that no time was saved between the two methods. The only good thing about avoiding a UV lamp means you cannot catch it on the way in and chip your nail and you can move your wrists around to avoid the terrible dull ache. But if something says it can last up to 14 days, to me suggesting at least a week, that little bit of drying time is going to be worth it. 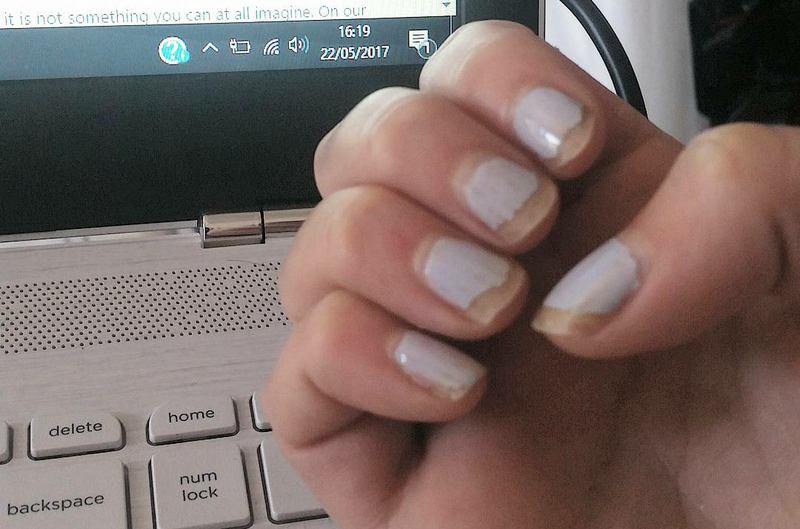 I work in an office, blog at home, use my phone and cook along with the other regular chore but I do not do the washing up or any really labour intensive tasks for the hands – to me the life my hands lead is a pretty similar one for a lot of nail varnish wearers up and down the country. My nails are well looked after, as mentioned above, and are strong with a varnish sticking to them well and grow at a reasonable rate. My nails scream average to good and however a nail product lasts on me is probably a good reflection for others. After applying on the evening of 17th May I was disappointed to reach the morning of the 22nd and find myself scrambling for the nail varnish remover because of the horrific state they were looking in. I have bottles of nail varnish that are years old that perform better than this particular one did but I will be giving it another go with a different shade and thicker layers of the colour and also the top coat. My first impressions have not particularly left me wowed or wanting to recommend these but Dive Right In, a bright teal blue, is the next shade on my to try list and I will share on instagram through updates in the caption how well that one survives. Throughout this post I have wanted to change between nail varnish, nail polish and nail paint, what do you find yourself mainly referring to it as? Leave your thoughts in the comments below. This entry was posted in Beauty, Nail Polish and tagged bblog, bblogger, bbloggers, Beauty, beauty blog, beauty blogger, beauty bloggers, beauty review, fashion, freebie, gel nails, gel nails at home, lblog, lblogger, lbloggers, life, Lifestyle, lifestyle blog, lifestyle blogger, lifestyle bloggers, manicure, nail art, Nail Polish, nail varnish, nails, Pr, press package, product review, review, rimmel, rimmel london, spring, style, summer, summer collection. Bookmark the permalink.